The US Coast Guard received a call from Carnival Triumph about 9am Friday morning (May 21) requesting a medevac for a 69-year-old woman who was experiencing breathing problems. An MH-65C Dolphin helicopter crew was launched from Air Station New Orleans and met Carnival Triumph when it was about 120 miles southeast of the Southwest Pass. As shown in the short video clip below, they hoisted her from the ship's deck above the aft pool (you can see the sliding dome closed over it) and transported her to a local hospital in New Orleans for treatment. Royal Caribbean reports that work is proceeding on their new Jamaican port at Falmouth, but not fast enough. The line has just pushed planned opening date back for the second or third time, depending on which ship you are talking about. When it does open, however, it's going to be a top-rated facility both from the cruise lines' and the passengers' perspectives. The complete article appeared in the May 21, 2010, edition of Cruise News Daily. Paul Gauguin has scheduled their first cruise from home base in Tahiti to New Zealand in November, and CEO Richard Bailey is going along to meet the passengers. Details appeared in the May 21, 2010, edition of Cruise News Daily. CND subscribers also read about a lapse in RCI security allowing a weapon aboard ... a new option for British cruisers who don't want the hassle of flying to their cruise ... some British passengers who just can't wait to sue the cruise line ... some really fancy Italian cooking on MSC ... and RCI setting records in Japan. Details appeared in the "Other Things You'll Want to Know" column in the May 21, 2010, edition of Cruise News Daily. Cunard's new liner, Queen Elizabeth, will be a sister to Queen Victoria. If you've ever seen the Grand Lobby aboard Queen Victoria, you know that it's the first part of the ship passengers normally see when they board, and your eye is drawn directly to the main staircase and the huge artwork at the landing. So when designing Queen Elizabeth, Cunard knew they wanted something special there, since it sets the tone for vessel and the entire voyage. They wanted something that said, "Britain," and something that said, "Cunard." Sure they could have gotten a wax figure of Benny Hill with a recorded voice saying, "Britain and Cunard," but instead they chose to go the less fun, but more upscale route and commission an 18-and-a-half-foot panel from David Linley, the Queen's only nephew and noted creator of fine furniture and marquetry. The complete article appeared in the May 20, 2010, edition of Cruise News Daily. Photos are in a newsfile on the CND website. Royal Caribbean International's ships will have 57 unique itineraries calling at 55 ports in Europe this summer, and to support that diversity, the line is expanding their shore excursion offerings for passengers who are interested in specialized categories of tours - family-friendly outings, flexible touring and easy and accessible excursions for those who are differently-abled. The complete story appeared in the May 20, 2010, edition of Cruise News Daily. CND subscribers also read about the Food Network going to sea ... and a new package for sailing from Cape Liberty cruise port which includes a hotel and free parking. Details appeared in the "Other Things You'll Want to Know" column in the May 20, 2010, edition of Cruise News Daily. TV-crime producer Jack Webb would have loved this, especially the ending. Late last January, the art dealer aboard a Holland America ship noticed that 27 pieces of art and sports memorabilia were missing after being unloaded from the cruise ship at Port Everglades.. After determining it wasn't going to show up, he went to the police, and they began an investigation. An arrest was made in the case on Tuesday. 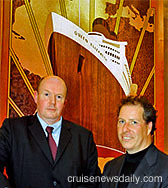 The complete story was carried in the May 19, 2010, edition of Cruise News Daily. CND subscribers also read about Carnival making a "splash" in Charleston ... Holland America throwing money around in the Yukon ... how a million people in Boston can't be wrong .. and a shaggy dog story at the Port of Palm Beach. Details appeared in the "Other Things You'll Want to Know" column in the May 19, 2010, edition of Cruise News Daily. Holland America's Nieuw Amsterdam has returned to the Fincantieri yard where it is being built after a successful sea trial. During the sea trials, they test literally hundreds of systems aboard the vessel - from the most important such as engines, down to the smallest. The line posted a couple of interesting videos on YouTube showing a couple of these tests. The video below was shot in the port side Azipod room. (The Azipods are the propulsion assemblies with the propellers which hang down under the ship and turn to steer it like outboard motors. This is in the control and equipment room for the left Azipod right down near the bottom of the ship, below where any passenger would ever go.) If you watch the video without knowing what's happening, it looks kind of silly, but one you understand about the sudden, sharp turns the ship is making, it all makes sense as you watch the engineers leaning to compensate for the centrifugal forces. And yes, they are having fun too. As we said, all systems get tested. That includes the ship's whistle (horn). In the second video, during a night test, they test it along with the ship's Morse (as in code) light, which is used in times of low visibility and during emergencies. And yes, again, they are probably having fun while they work. Carnival's Laser Tag is officially a keeper. After being tested on four ships last year, Carnival realized they had a hit on their hands, and decided it should be rolled out across the fleet. The activity is now available on 21 Carnival ships (every one except Carnival Pride where it will soon be installed). Details were carried in the May 18 edition of Cruise News Daily. Norwegian Epic will have more entertainment and dining choices than any other NCL ship. Consequently, they needed a system to help you organize it all and make sure you get to enjoy everything you want during your cruise. And today, they have it. The line launched an advance reservation system for the entertainment venues aboard Norwegian Epic. Passengers may make reservations for shows beginning 45 days before their sailing date. Details were in the May 17, 2010, edition of Cruise News Daily. cruises for the 2010-11 Caribbean season. Baseball fans really enjoy the easy access to the baseball greats sailing on each cruise. November 14, 2010: 7-night Eastern Caribbean calling at St. Thomas, U.S. Virgin Islands; Philipsburg, St. Maarten; and Nassau, Bahamas. Featured former players include: Bob Feller, Tommy Davis, Glenn Beckert, Clarence Jones, and Stan Bahnsen. December 5, 2010: 7-night Western Caribbean, calling at Key West, Florida; Ocho Rios, Jamaica; Georgetown, Grand Cayman; and Cozumel, Mexico. Featured former players include: Graig Nettles, Amos Otis, Dave Campbell, Stan Bahnsen and one more still to be announced. January 9, 2011: 7-night Eastern Caribbean. Featured former players include: Stan Bahnsen and four more still to be announced. January 23, 2011: 7-night Eastern Caribbean. Featured former players include: Rick Burleson, Jim Fregosi, Rick Wise, Stan Bahnsen one more to come. February 6, 2011: 7-night Eastern Caribbean. Featured former players include: Stan Bahnsen and four more still to be announced. Rates begin at $529 per person, based on double occupancy, plus $69.62 government fees and taxes). Rates and players are subject to change. In this video, you can see the woman being hoisted from the bow of the ship, and in a nice change from the norm, you can hear a female voice (the rescue swimmer) directing the operation from below. The woman was transported to a local Atlantic City hospital for treatment. Veendam had just departed New York late Sunday afternoon (May 16, 2010) en route to Bermuda. A caller to Royal Caribbean's Wichita reservations office reported a bomb aboard Liberty of the Seas about 5pm on Saturday. Crews aboard the ship searched the ship's interior but found nothing. The ship proceeded on its schedule to Miami where it arrived at 6am on Sunday morning. Coast Guard vessels escorted the ship to its berth at the Port of Miami where FBI, Immigration & Customs Enforcement and Customs & Border Protection agents again searched the ship and investigated. They cleared the ship to resume normal operation Sunday afternoon. Further details will be in Monday's edition of Cruise News Daily.